In Orwell’s classic Animal Farm the characters often oscillate between their evaluative assessments on the merits of two or four legs. The value was socially constructed, however in practice there are real tangible benefits socially and otherwise to having two legs, which serves as an apt metaphor for understanding the role of scaling in social innovation. I was fortunate to be born with two very functional legs. Since I could first walk and run I’ve done so continually with enthusiasm onward of decades. However, there have been times through injury, experimentation or fun that I’ve tried navigating my life with one leg. On the matter of movement I can say that two legs are not twice as good as one, they are an order of magnitude better. Likewise, I’ve done three-legged races and can definitely say that the benefits of two legs over one do not scale up to three. It’s a toss up whether I’d rather have one leg over three (irrespective of the horrible pant problems three legs would pose to me). I want two and I suspect you do too. Two legs, no more or less are optimal. If you’re a dog, that can be doubled. If you’re a millipede, you might need to add a few hundred legs to be optimal. So legs scale, but only when you know what the context is. We don’t know what will scale with all things (and I would argue most things). I have been and remain critical of the dominant push to scaling social innovation out of a misguided, often patriarchal perspective that holds bigger is better. Bigger is bigger and occasionally that means better; they are not equivalent terms. To get a sense of what scale means: imagine a shower. If you’re the man below, a shower is a pretty good way to get clean. 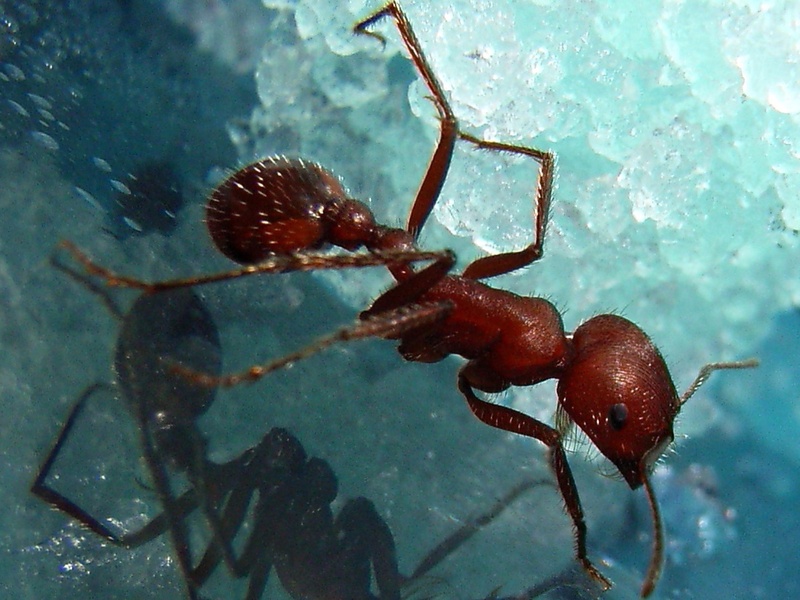 Now imagine you’re an ant like the one below. You still get dirty, but how good is the shower to you? The ant is going to experience those drops of water that are cleaning up the man’s skin much differently in ways that might literally mean life or death. Now what might happen if you were a woman? Suddenly, the scale works again. Different being, similar outcome. Is the shower better for the man, the ant or the woman? Did it scale up and down well? The answers have as much to do with what the point of the shower was in the first place and the perspective we take at the outset. Embedded within this mission is an assumption of scaling that isn’t congruent with human relationships. The accumulation of friends on Facebook — something it strives to support — ceases to reflect a reality where our relations come and go, become more or less intense, and often do so on a time frame that can be momentary or develop over a lifetime. All of these relationship scenarios occur simultaneously. On Facebook, they all happen at the same time in the same way, treating relationships as a matter of linear accumulation than a non-linear, dynamic set of temporal engagements. Anthropologist Robin Dunbar has looked at relationship scaling and developed his famous number of 150 (+/- 50 or so — it’s not precise) for the mean amount of intimate or stable relations that a person can have. Of course, 150 dynamic relations — of which many will not be interested in relating online — is not profitable so Facebook has every investment in having you expand your network in a linear or even exponential manner in defiance of evidence to suggest its futile. Little did he know how prescient he would be (and how many Star Trek fans he might annoy in that statement). One of the ways to gauge scalability is by the level of resistance to the core function of the activity. To return to the matter of legs, one leg creates resistance throughout the body because of the shock of a single, hopping prop used to propel a body not suited to a single leg. When you see two legs move, there is fluidity within the system that enables a movement that is resisted if you add or subtract a leg. In other words: the body was designed for two legs. In social systems, the designs we work with are co-created and inherited. 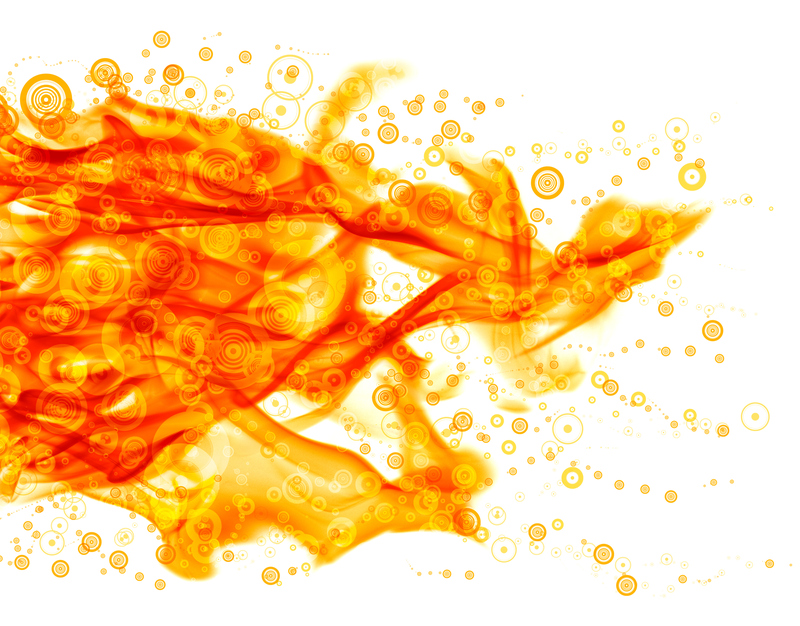 In social innovation we often don’t know what the scale of something is often because we don’t know what the natural scale of our social creations are, or that we have no evaluative data to make developmental design decisions. Paying attention to scale and resistance is one way to get a sense of where natural human resistance to change ends and real system-level resistance to scaling begins. I argue that a developmental evaluation and developmental design approach with the right quantitative and qualitative tools can help immensely if combined with mindful attention to these details. Research — like that of Robin Dunbar and others looking at social systems — can be a guide. We have evidence of programs and ideas scaling well and some not taking at all. A more anthropological, mindful and evaluative approach to understanding what we’ve done and what we’re doing can help when taken together with strategy and knowing our intent. If what we want is better social worlds, maybe two legs are not half of four, but many times better after all. Giga OM founder and prolific reader Om Malik posted a reflection on his reading habits on his blog that got me thinking about the way we consume, rate and appreciate content online. In this post, Malik shares some of the dialogue he has with the CEO of Pocket, a read-it-later service that allows you to save webpages you’re unable or unwilling to read at the moment you find them. It’s a great service and I love using it, but it is a source of guilt — which is what struck me about the exchange. I, like Malik, am also a voracious book buyer. My ‘to-read’ list is enormous and I am constantly feeling behind or wondering whether I have sufficiently caught up or processing what I need. Talking with others, this is shared and clearly Pocket is aware of this. The metric of words saved and read which, in the case of Om was two novels worth per month, is oddly reassuring that all that content consumed in webpages and tweets and such is adding up to something. The bigger issue and quest might be (a la Dr Strangelove): how to stop worrying and love content. One of the things I like about the internet (as opposed to hating it) is the opportunity to engage in meaningful discussions with really smart people and walk away more educated from those interactions. Earlier this week, I blogged about my save-and-read-it-later habits based on data from Pocket, which is my de facto TiVo for the web. My conclusion looking at the data was that I am reading a lot less than I thought (only about a third of what I was saving) and promised to work harder to get through more articles. Public health is regrettably not a field that I often think of when I consider powerful examples of using social media for change and impact, but every so often something changes that. 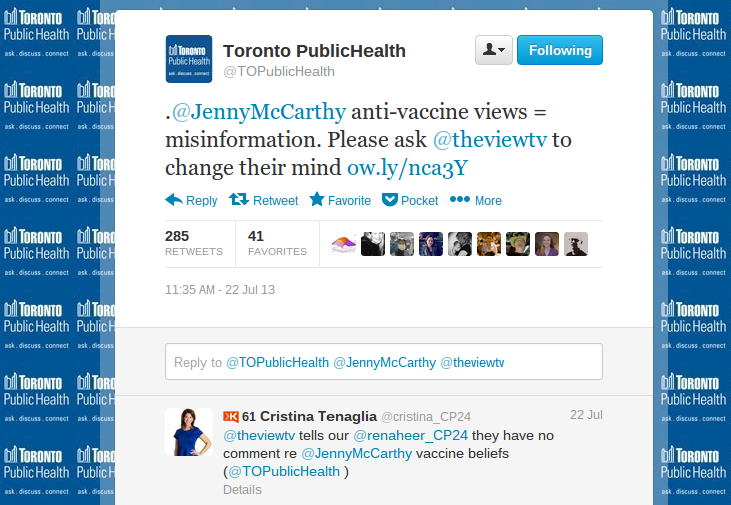 Toronto Public Health, one of the largest health units of its kind in North America, took to Twitter to voice its concern over the hiring of Jenny McCarthy as a co-host of the popular talk show “The View“. The issue at hand is Ms McCarthy’s vocal advocacy of non-vaccination for children and support for widely discredited and fraudulent scientific claims about the nature of autism and its link to childhood vaccination. On Monday they took to Twitter and suggested to their followers that they voice their concerns to the TV show about the hire and the message its new host sends out. The single tweet caused a tempest well-beyond teapots.Twitter and mainstream news organizations jumped on the story bringing widespread media attention to TPH’s message and that of Jenny McCarthy (even though reporters like Andre Picard from the Globe and Mail newspaper have been bringing attention to this for a long time). As one who works with public health units to help them with social media communications this was heartening to see. Toronto Public Health has been a rare example of a mainstream public health organization that has sought to “get” social media and how it works. Indeed, one of their former staff members is a co-creator of a blog devoted to social media and public health. Kudos to them all. (full disclosure: Toronto Public Health is a recent client of mine for social media communications work, however I’ve had no direct involvement with their messaging or am currently under their employ or contract). Yet, the presence of public health in such conversations on social media is troubling. I conducted a resource review a year ago looking at social media and its use in support of youth-related substance use prevention and treatment (PDF) (including tobacco, alcohol, and illicit drugs, areas where there is much discussed via social media) and was shocked to find such a tepid presence of public health organizations operating in that sphere. Public health still needs to understand how social networks can amplify a message and what happened Monday just might help make that case. As of today, the direct re-tweets of that message was at 286, but with the many re-tweets not captured by Twitter’s service it is safe to assume the real number is much higher. But a look at the first few Twitter users on the re-tweet list shows the expansive network effects that the message had, even if most of those on that visible part of the list have less than 100 followers themselves. 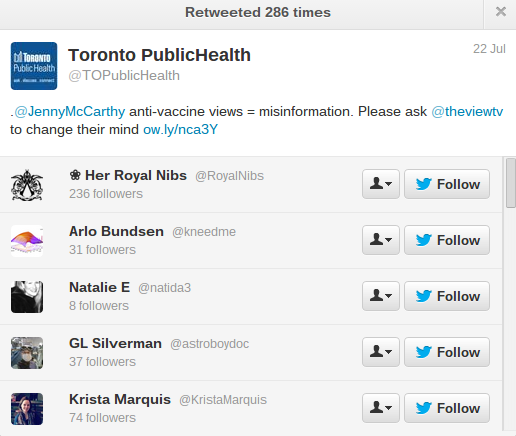 The repeated use of the message and linking it back to different users and articles immediately brings attention beyond Toronto Public Health’s initial 8,450 followers. With one tweet, a message that was lost in the news amidst the other issues last week when McCarthy’s hire was first announced was brought back to life and into the public consciousness. Drawing eyeballs, but more importantly ‘mindshare’, is what TPH did. From a public health communications perspective that is as good as gold. Whether the ‘campaign’ (one Tweet hardly constitutes a campaign as some suggest) is successful in causing the producers of the ABC TV show to reconsider or not remains to be seen. But no matter what the issue of vaccinations was brought up and offered public health an invaluable ‘teachable moment’ for the public on the issue of misinformation and evidence. Then there is the case of the journalism program at Carleton University that recently got called out for behaviour that suggests it really doesn’t get Twitter or how social media propagates messaging. By calling attention to something small and silly they have given the account the very attention it sought to avoid. Social media is an imperfect space for communications, but there is little denying it has the power to profoundly engage the public in small and large ways on issues that are of importance to them. That is the lesson for public health professionals. Social media realizes [media scholar and McLuhan collaborator Edmund Snow] Carpenter’s vision by placing participation and co-production at its core. 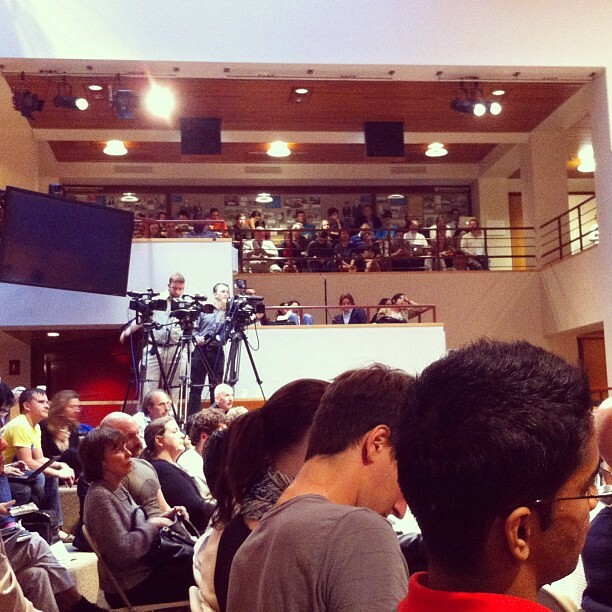 It has transformed mass electronic communications from lectures to conversations. This fundamentally changes the way knowledge is created, valued and the social power that comes with that knowledge, taking it from professional or community domains and placing it into a form of digital agora woven by information created through conversation rather than broadcasting. It isn’t whether social media is good or bad, but whether health promoters and public health professionals wish to be part of a conversation about the issues that influence public health when they need to happen or not. If public participation and engagement is a key driver of policy or programs, which are a driver of social change at a population level, why would we not use it? With the tragic events surrounding the Boston Marathon bombings today, the strength and weaknesses of Twitter and the new media for journalism gets brought out for everyone to see. 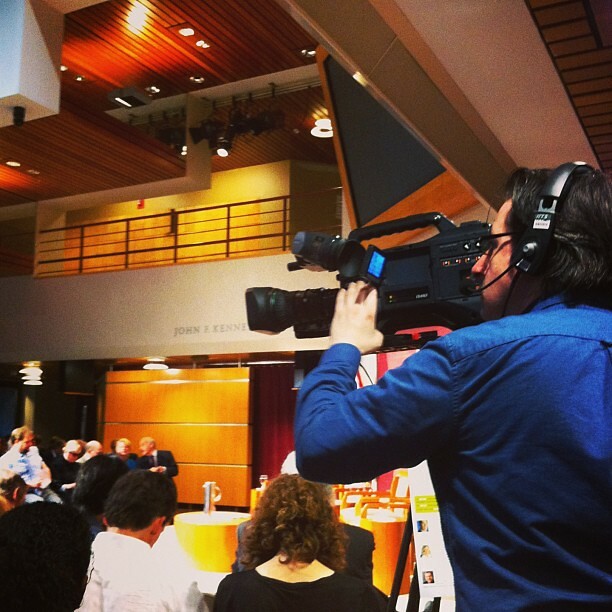 The news is changing and the importance of traditional journalism and citizen witness reporting all comes together. Much to consider as we reflect on the ways of the world and try to make it a better place while others seek otherwise.